As you can gather from my previous five reviews, reading Birthright has been a pretty positive experience for me. That is, until issue #6. “The Remains of Krypton” could be summed up as a polarizing experience, with many aspects just as appealing as others were disappointing. Let’s get the disappointing aspects out of the way. First of all, beyond the story itself, there was a constellation of outside factors than came together to dampen my enjoyment of the story. The recent publication of the time-paradox story in Superman #200 added more ambiguity to Birthright, a series that has already had more than enough ambiguity swirling around it. Fans continue to wonder if Birthright is the “real deal” and, judging from Superman #200, DC hasn’t made up its mind yet. The late publication of Birthright also contributed to my wavering goodwill toward the project. I can’t imagine a creative team with as much lead-time as the Birthright guys could have been late, so the delay must have more to do with the behind-the-scenes gerrymandering we’ve grown accustomed to with DC’s Superman franchise, rather than deadline trouble. Whatever the reason, it’s annoying and unprofessional. The story itself seemed to suffer from a lack of momentum, built up so well over the previous issues. As you recall, Superman’s public debut quickly led to the big “reveal” of Lex Luthor and his underlying mystery, culminating in last issue’s closing shot of his secret Kryptonian artifact (complete with a mysterious “S symbol”). Unfortunately, Waid squandered this momentum for the “Ripped from the Headlines” social activism opened the story. I presume this sequence was Waid’s attempt to channel the prototypical Siegel and Shuster Superman, which seems to have become almost a rite of passage among modern Superman writers. Yeah, it’s supposed to be fun seeing Superman scare Mr. Stereotype Dirtbag Gun-Guy, but I would think a guy like Clark, even at this early stage in his new “career”, would have some knowledge of (and respect for) Due Process….something that didn’t exist in its current form during Siegel and Shuster’s era. 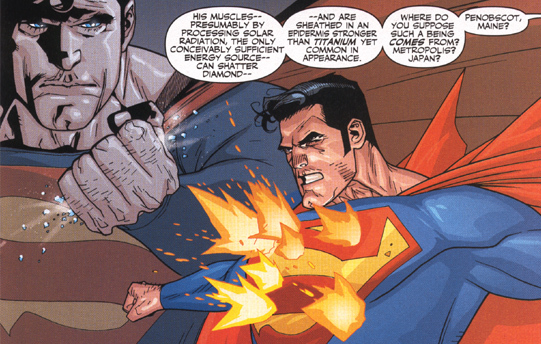 It’s visceral and vicariously satisfying, but sorry…it’s just not Superman. Another serious “buzz-kill” was the Daily Planet scene, where the characters acted and talked more like nitwits from a TV sitcom. Like many of Waid’s early Fantastic Four issues, the humor seemed labored and bit too precious. I don’t know about you, but the Lois presented in this issue of Birthright is someone I definitely do not like… much less respect. Like the Lois Lane of the “regular” Superman titles, she’s an obnoxious, shallow bore. Rather than reinvigorating the Lois Lane character with a more nuanced, sophisticated personality, Waid has chosen to stick with the tried-and-true “pushy broad” stereotype. Instead of Katherine Hepburn, we get Lucy, the bossy, football-snatching foil of Charlie Brown. I expected a lot more from Mark Waid. Leinil Yu’s artwork was a bit of a disappointment this time around. 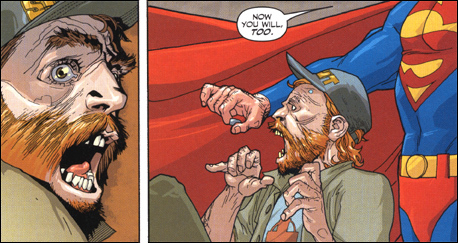 In a strange parallel with the writing, many of Yu’s characters were caricatured to the point of distraction, particularly his Clark Kent, whose mouth, chin and glasses took on bizarre new configurations from panel to panel. I thought the panels showing a dissected Superman were too over-the-top, especially for a project that is supposedly aimed at new and younger readers. One can argue that many kids today are comfortable with that level of gore, but I don’t believe Superman comics should ever cater to that sort of jaded sensibility. Overall, his artwork had a “rushed” quality that I hadn’t detected in previous issues of Birthright, lending a bit more credibility to the “deadline trouble” theory on why this issue was published late. However, there were a few positives to take away from the story. I was thrilled to see Waid moving away from (if not flat-out rejecting) John Byrne’s reconfigured explanation of Superman’s powers, such as returning his invulnerability to properties of his skin rather than some inane “personal force field”. Krypton itself was also restored to the “super-gigantic” physical status of the Pre-Byrne era, which somehow just seems to fit the Superman mythos better. I also appreciated seeing Luthor portrayed as a warped intellectual giant and not merely the soap-opera schemer we’ve long grown accustomed to. Luthor’s intellect should be threatening, not his money. 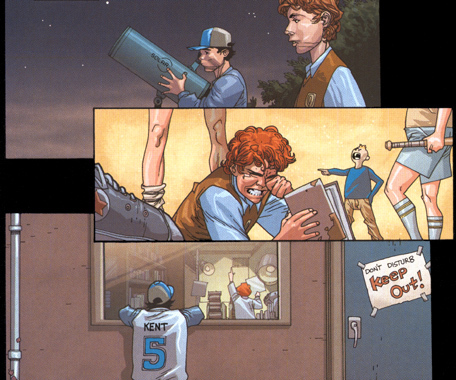 Add to this the surprise of seeing Luthor placed in Smallville at an even younger age than previously implied, and I must say I’m quite pleased with the state of compromise between the Pre and Post-Byrne Lex Luthors. I’m anxious to see where all of this is going. So, while not a total loss, this issue seemed to be a somewhat disappointing pause in an otherwise entertaining and well-crafted series. Let’s hope the next issue gets things back on track.